This is the only necessary type of card per deck. The hero is meant to be a critical part of how the deck functions as his or her ability will increase the deck's potential and give it a purpose. Each hero grants you a skill, similar to a skill shrine (see below). These are the resource cards in your deck and come in three flavors. The first type is a basic shrine which gives you one unused mana and a card draw or an aspect. The second type is called a 'skill shrine' and will grant you an ability (capped at 3) or an aspect. The final type is a utility shrine which will grant you a split aspect or double aspect and have another effect as a spell. These are the attacking and defending cards on your board. They are used in almost every deck and have a stat line and often passive or active abilities. They face eachother in combat and if able, can attack a Hero's life total. Sometimes creatures are also artifacts (see below). Spells are any cards which are not heroes, shrines, creatures or artifacts. They come in four different flavors. Instant spells can be played during combat and on the opponents turn. Action spells last only during your turn. Blessings are spells that stay on the board for at least 2 turns and help you. Curses are spells that stay on the board at least two turns and hinder the opponent, generally speaking. 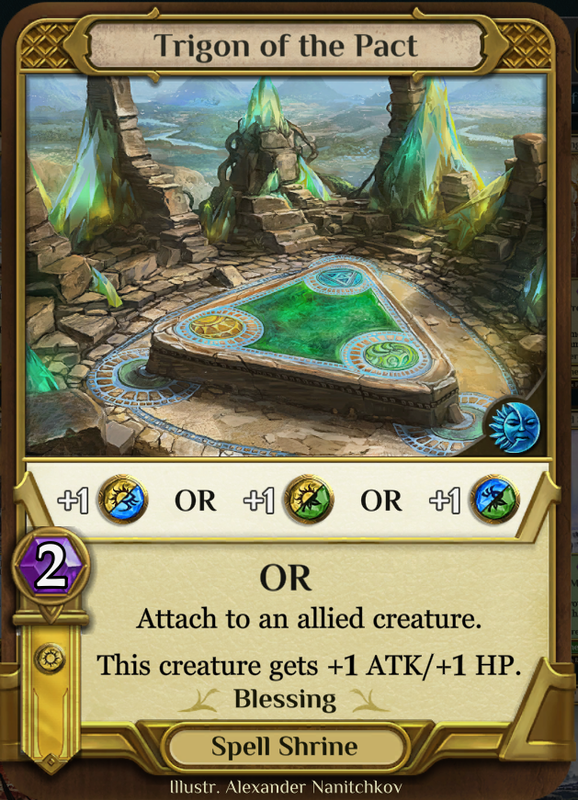 Artifacts are like spells in that they stay on the field more than one turn, often are activated through using resources or by cards entering the field. Artifacts may also exists as or turn into creatures with the "artifact creature" tag.